Trump's 'Birth Certificate' Has Sharp Wits Trying To Outmock Each Other : The Two-Way And the mockery is bi-partisan after Trump releases what turns out not to be a real birth certificate of his own. It started with Ben Smith of Politico writing that Donald Trump's mother, "it should be noted, was born in Scotland, which is not part of the United States. His plane is registered in the Bahamas, also a foreign country. This fact pattern — along with the wave of new questions surrounding what he claims is a birth certificate — raises serious doubts about his eligibility to serve as President of the United States." Fox News' Fox Nation blog has joined in, wondering "what is Trump trying to conceal?" -- "Donald Trump Birth Certificate Released By Potential Presidential Candidate." 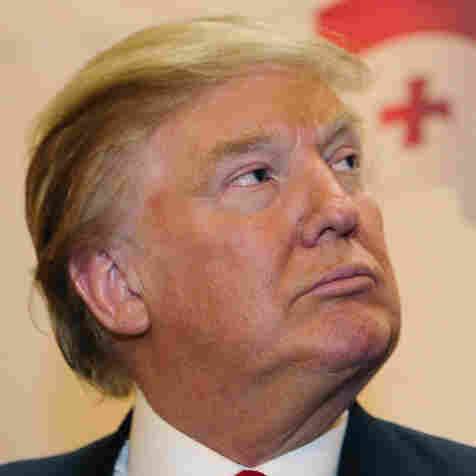 -- "I Demand Proof That Trump's Hair Is His Own — And American." And U.S. News' Robert Schlesinger wonders if "birther Donald Trump [is] a Democratic sleeper agent?" All this because after challenging President Obama (as "birthers" do) to produce (again) his birth certificate, Trump (who claims to be mulling a GOP presidential bid) on Monday released what he said was his own. But, it turns out, what he made public was not a birth certificate. Politico says it was a New York hospital's unofficial "certificate of birth." Perhaps "the Donald" needs to tell whichever aide came up with that piece of paper that "you're fired!" Feel free to insert your own witty remaks in the comments thread.